I confess - I'm going for an artistic shot here. 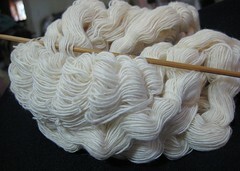 This is three skeins of handspun cotton, the stuff from the back yard, spun on my electric spinning wheel, the SpinTech. Here's a bit more realistic shot. The knitting needle? 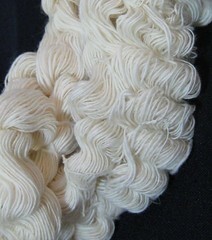 A size 3 dpn. I'm purposely not measuring and getting all OCD about grist or yards per pound/ypp. I will try to sample, but I don't want to get too involved in the numbers to see what's going on. I'm feeling more centered today- thanks for the input, people. In reading Friday's entry, I realize that I started out thinking I was going to get deep and philosophical, but by the end... Well, my standard joke is that I need to hand out hip boots, with the implication that what's deep is from the barnyard and pretty stinky. The Roketman wanted to see a boat that's been listed for sale, and recently reduced in price. So, we drove out to Marina del Rey. I don't have pictures, because the owners are still living in the boat, and it just doesn't seem polite... but it was a very nice boat. We're not ready to buy at all- RM wants to have a custom boat built. 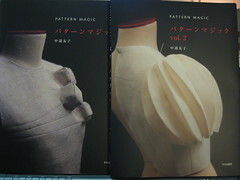 I'm leaning toward something like this one, but it's a bit too big to be transportable. After seeing the boat, I asked if we could swing by Little Toyko, to the Kinokuniya bookstore. 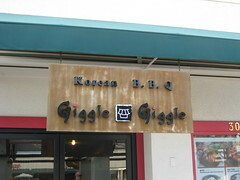 This is where we had dinner - how can you help loving a place called Giggle Giggle Korean BBQ? 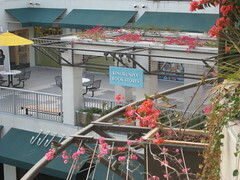 This is a shot of the Kinokuniya bookstore.